I have been working in the garden this week. 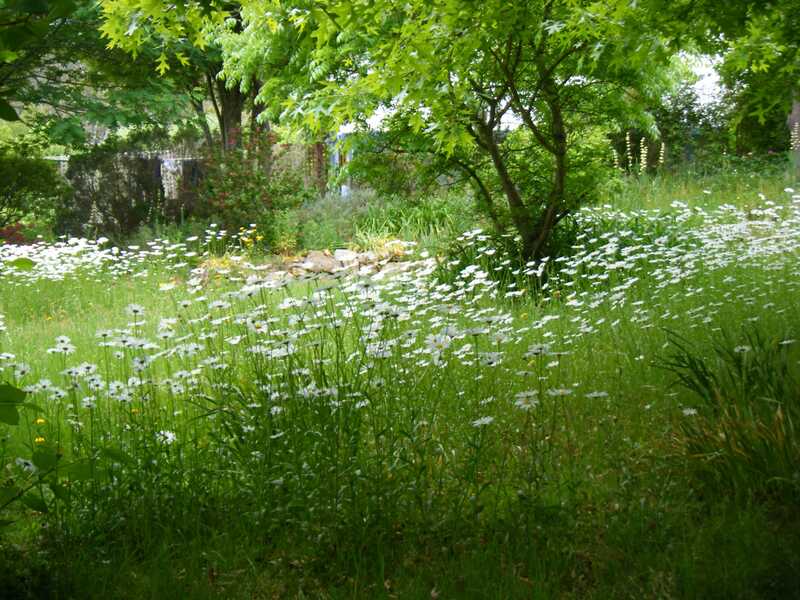 Part of the garden has wild flowers (mainly oxeye daisies, Lecanthemum vulgare) in it during the Summer and I noticed that one of the wild flowers was growing (strongly) away from the other flowers. I missed Howard Rheingold in the first Elluminate session and have not participated in the Ustream discussions so me and the wild flower have a lot in common this week. There is action going on somewhere but we are away from it! I read Stephen’s 2004 paper on Reusable Media, Social Software and Openness in Education and his 2006 article on Sustainable Open Education Resources. I watched Stephen’s Seven Questions video (I hope it was recorded at 4 p.m.) and followed up the Daily link to Stephen’s presentation on Open Educational Resources and his Blip TV video on Openness in Education (Bradley wrote a detailed response to this presentation). I went back to read the Seeley Brown and Adler paper. … the effects of changing agent characteristics, demonstrating that crowding behavior takes place among agents of similar memory, and show how this allows unique `rogue’ agents with higher memory values to take advantage of a majority population. I’m about to embark on a 6-week connectivism project with my Contemporary Issues class. They will build a personal learning environment based on a topic for which they have great interest. I will take on a number of new roles including that of modeler, network administrator, curator, concierge, community leader, technology steward, information filter, Sherpa, researcher, change agent, learning entrepreneur, and evaluator. Some of these roles will be foreign and uncomfortable. But, I’m open minded, confident, ready to experiment, and prepared to learn from my mistakes. I read Ailsa‘a contemplation of appreciative and iterative change (inspired by Nancy White) and her discussion of agile development. (Dave Cormier wrote this week about communities and linked to Nancy too.) Rita wrote about groups, networks and collectives and shared news of the ECEL conference in Cyprus. Ariel has been visiting a virtual worlds in education conference and his notes are here. Ken posted this week on analogies and followed up with a second post. What makes one person take (this) responsibility more seriously than another? Is it in order to fulfil a personal need rather than to benefit the community? And how do notions of responsibility to a network of learners fit with ‘connectivism’? Frances‘s detailed discussion of connectivism as a learning network stopped me in my tracks. I have mentioned before that I must look carefully at ANT and her post is a very good reason why I must accelerate my reading. I had thought that connectivism is open to its own revision. Three thinkers from my network of dead people, Marx (withering away of the state), Weber (science open to on-going change) and Kelly (there are infinite alternative constructions of reality) gave me good reason to think this. I looked at John Mak’s alphabet post and admired his writing productivity over the last few weeks (this week a response to Bradley‘s book review and this post on connectivism, for examples). I noticed Andreas‘s post about optional assignments and am finding myself more and more interested in his approach to learning (later in the week he posted about frustrated students and assignment 2). I look forward to Lisa’s posts and this week she discussed the ontological turn. I noticed her mention of John Holt. Bradley discussed a different kind of ontology later in the week. 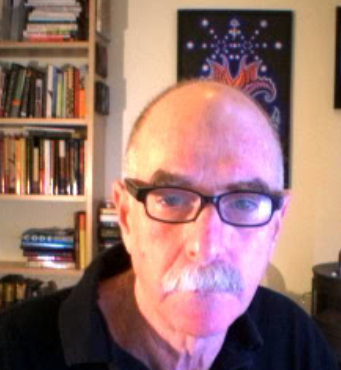 The Daily linked me to Howard Rheingold’s TED talk (I noticed that Eyal Sivan had posted a comment there linking to this detailed post about “enlightened self interest”), to the review of Smart Mobs and a link to the online book the Virtual Community. Lori posted a link to the Social Media Classroom at the start of the Elluminate session. I did listen with great interest to the recording of Howard’s Elluminate session and noticed a number of comments on the chat board at the end that participants were going to re-listen. This first session takes place early in the morning In Australia so I have been a second-session-Elluminate-kind-of-person. I was interested to see who participated in the first session and noticed that there were 45 wildflowers in the list of participants (Howard, George, Stephen, Adrian, Alan, Anachorete, Bee, Bill, Bradley, Ctscho, DebbyK, Dendari, Derbaum, Dolors, Emcdef, Frank, Gabi, Grant, Iamarf, Jabiz, Jcrom, Jennymack, Joel, Jon K, Jorgen, Juliana, Lindaleea, Lisa, Lori, Lynn, Marc, Maru, Mary, Matthias, Mic, RCJones, RNolan, Roland, Romi, Sasa, Sharon, Silvia, Steve, Sylvia, Teresa, Todd, Wendy). It was great to hear Howard talk about his work and to hear the voices of other CCK08 participants. Listening in lapsed-time gave me the opportunity to pause and follow up some points in more detail. There seemed to be an early exchange about wiki formats and blogging going on on the chat board and Alan posted a link to this excellent Common Craft explanation of a wiki (there is a video too). (Subsequently I found this post on CogDogBlog.) Steve posted a link to his Connectivism pbwiki and to an SL Experiments wiki. I was delighted when Howard indicated some of the influences on his development (Postman and Weingartner, Freire, Dewey and Goffman). Bee (and others) have some tweets about this session. Earlier this week “Linker Taylor” posted that “I have always been comfortable as the connector – someone who notices all sorts of odd bits of information, then finds opportunities to pass along the information in the most unlike situations.” This week has seen me trying to connect despite the appeal of early Summer In Australia and a wild flower garden. 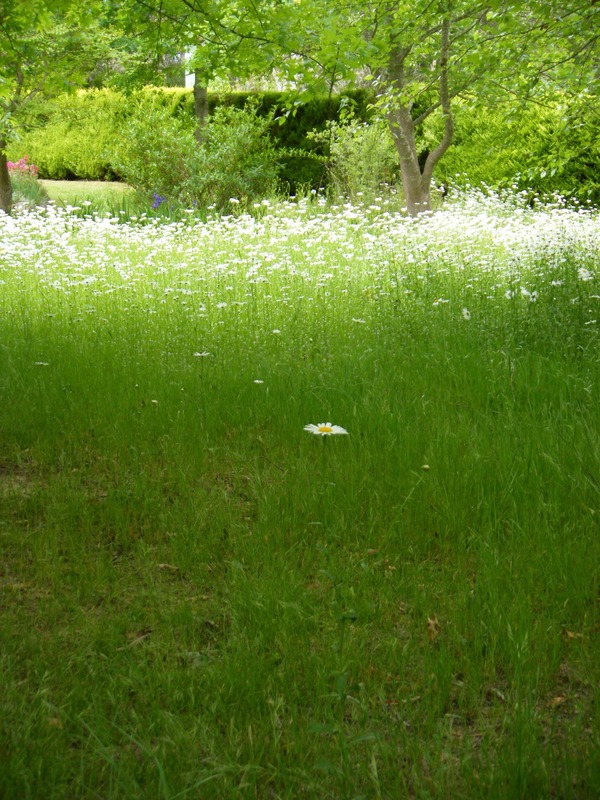 I should let Lani know that it is a real and virtual organic garden … and perhaps George will appreciate life in a rural society given his connectedness challenges this week. Good teachers inspire their students to learn away from the classroom as well as in it – thinking is the first mobile technology – the question is how do institutions learn about what is appropriate support for learners and teachers using social software. It has been a busy time in the backyard for Jenni too. Her post shares her interest in VoiceThread as an introduction tool for an on-line course. Linarmstrong has post about dyslexia and theories. Linarmstrong and Matthias have posted their short paper three. Eduardo‘s post on the lifecyscles of communities and networks was a timely reminder about egocentric and object centric networks discussed earlier in CCK08. In doing so it prompted me to read more of Michele Martin‘s work. WordPress Tag Surfer brought me Mark’s Wordle post, Ariel‘s discussion of Openness and Twitter, two posts by ulop (one on freedom and one on connectivism), and John Mak‘s post on individual development, networks and communities (and linked to his earlier post). This post started its journey with Lani’s post. I read it early morning on Wednesday in Mongarlowe, the birds were singing and there was a beautiful blue sky. It was the start of another great day in paradise found. Lani’s post was very brief and shared a link to Clarence Fisher‘s site (Stephen had linked to Clarence in OLDaily to a different post about classrooms). If I had been reading an earlier post by Lani more carefully I would have noticed her acknowledgement of Clarence and her link to Mark Ahlness‘ blog too. Clarence and Mark are teachers. David Weinberger Skyped into my classroom today. This alone is amazing enough, but the story of how this took place is another showing of the power of the web. The students in my class not that long ago read the kids version of Small Pieces Loosely Joined called What the Web is For. From this, we discussed and worked through several things, ending up in an activity where the students had to make a representation of what they think the web looks like. You may have seen the flickr pictures. I put this together into a blog post tagged, among other things, David Weinberger. Mr. Weinberger found this and was good enough to respond with a kind comment about the work we do in our classroom. A flurry of email ensued, topics were tossed around a date was set. Promptly at 1 PM today Mr. Weinberger called and we spent 30 minutes with one of the finest thinkers in the world discussing how literacy is changing and how the web has changed ideas of success, making things possible which only a short time ago were simply not. Another interesting topic that came up was the idea of freedom of speech and if it is right that “bad stuff” is allowed on the internet. Shy at first, eventiually the students in my class warmed up enough and asked a number of questions. When I wrote my Stacks post I did mention my utopian commitment to CCK08. (John commented on the post and my post here is in part a response to his comments). Clarence’s post exemplifies how wonderful the education process is in the care of passionate teachers. I was wondering how Clarence’s students’ families dealt with the excitement of news of Mr Weinberger’s call. I wondered too if education messages are best received in times of hope exemplified in Mr Weinberger’s post here. CCK08 is a marvellous example of “thinking locally and connecting globally”. Lani introduces me to Clarence and Mark. I follow Clarence’s post and meet David Weinberger and can do so with my left brain and right brain! So at three degrees of separation in thirty minutes I am wondering why I have missed so much of David Weinberger’s writing. This morning is a teachable moment for me and it was not timetabled. Stephen Downes has been my guide on my journey into educational technology and much, much more. CCK08 is now offering me many guides to develop my understanding of the possibilities of education. Clarence is today’s guide and David has taken over the lead given to me by Lani. In other posts I have indicated my epistemological roots. I am a child of the Ivan Illich and Paulo Freire times. I was inexorably attracted to Neil Postman and Charles Weingartner‘s work. In the early 1970’s I was introduced to the sociology of education and found the readings in Knowledge and Control intuitively attractive. 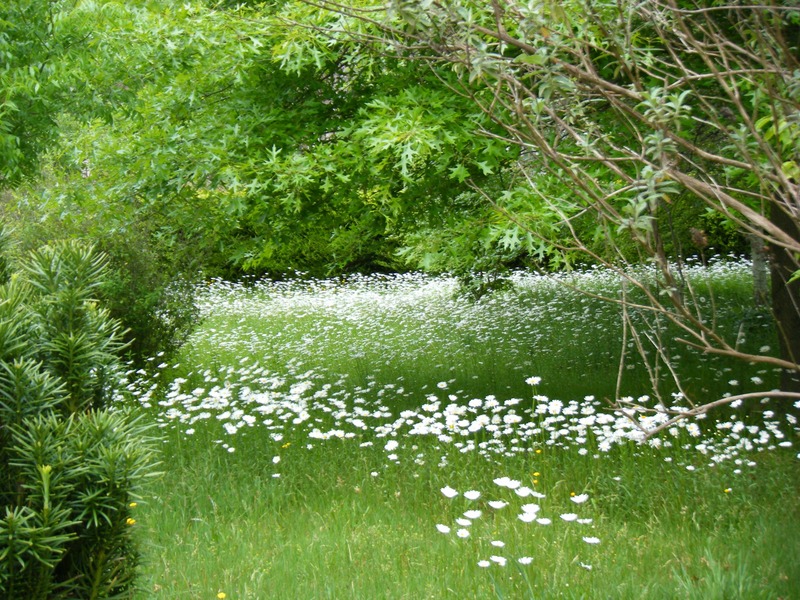 A decade later I found myself in Dartington (UK) and was involved in the emergence of a co-operative school made possible by the community building legacy of the Elmhirsts of Dartington descrived so vividly by Michael Young. I read about Black Mountain College in the Library at Dartington. We need to help children to understand their own individual importance so that they face the world with the friendly confidence that makes progress possible. We need to help children to understand that it is a natural human instinct to want to care for others and that we suffer if we ignore this instinct. We need to help children to understand what they themselves are capable of, so that they can use their talents to the full. And we need to help children to understand that learning is a pleasure … we want to learn simply because we want to know. Children who leave school understanding all these things will be wise – wise enough to understand also that their education is only the beginning. All through their lives they will persist in the search for truth. Lani, Charles, Mark and Mr Weinberger reinforced my view that education is not a one day thing, or a someday thing, it is a right now, every day thing. I believe education has an innocence that enriches our very being. This has been another slow blogging week for me in CCK08. 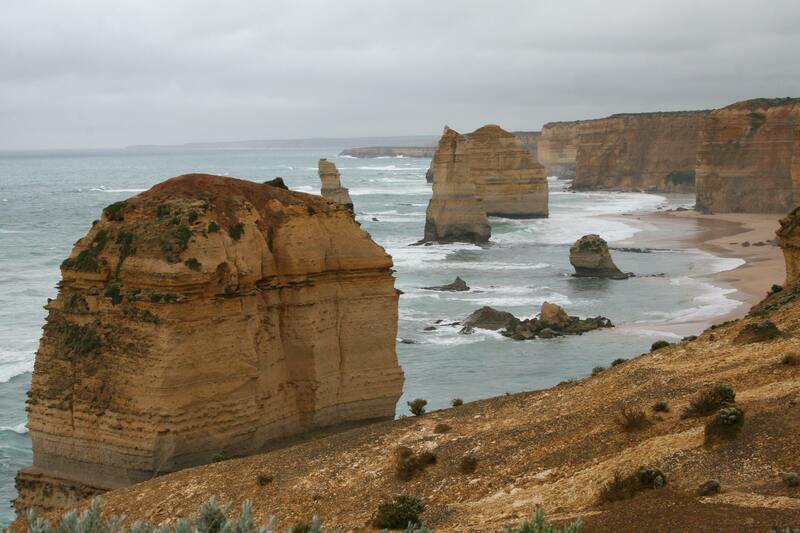 I have just returned from a visit to the Great Ocean Road in Victoria Australia. 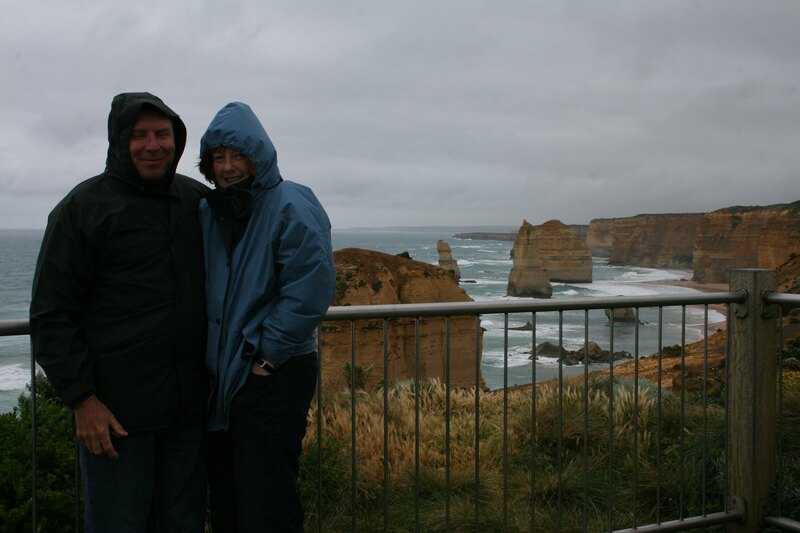 I visited the Twelve Apostles on a very windy day. The wind was so strong that it was difficult to stay there very long. My photographs catured a particular kind of visit. Despite the brevity of my stay I was in awe of the scale of the sea stacks and realised very graphically how changes occur in lanscape in geographical time. Strange that I should be thinking about CCK08 at such a moment! I was accessing my email whilst on the road and thought that the course had a tide running from a southern ocean. There were a number of voices questioning the exercise of power and the after-effects of Stephen’s week 8 impact. Jenny wrote a thoughtful post about this after her week away (four CCK08 colleagues responded to her post directly and it was included as the first item in The Daily). Wendy provided some visualisations that in her post “It just seemed logical for me to differentiate between individual, group, and network power, as well as perceived and actual power.” A link to Wendy’s post appeared in The Daily. Grant shared his take on the week and linked to Lisa’s post to discuss ‘personality’. ‘Turning up the juice’ as a personal response to the exercise of power struck me as a great approach for confident learners. I wonder if it has a lot to do with hair? Carmen’s post made me smile. The blog post title was great and the content thought-provoking. I should have commented on the post when I read it. I liked the follow up post on paradigms and power. Carmen‘s posts throughout this course have encouraged me to celebrate humour as a powerful (sic) device. Pierfranco brought an interesting insight to readers of his post in the discussion of social class and power. His writing has encouraged me to think how a course in connectivism can be enriched by the granularity provided in languages other than English. (I wondered if I read and spoke Italian well enough my understanding of Gaetano Mosca, Robert Michels and Antonio Gramsci might have been very different.) Andreas‘s post confirmed this for me. Jon did demonstrate what a forthright language English can be in his post. Viplav reviewed some of the Moodle discussions about ‘power’ and The Daily linked to Bradleyshoebottom‘s discussion of ‘authority’. In the same edition of The Daily, Ailsa’s post in the Moodle Forum was noted. I realised that I have not addressed the ANT issues in my own thinking and thanks to Ailsa’s post need to follow up on Foucault too. Discussions about power and authority were interspersed with questions about the ‘failure’ of CCK08. Ken’s post has received 15 comments (to date) and led Ken to post this a few days after the Failing post. In between The Daily alerted readers to Ken’s post and Ken posted this aside. He posted this too. He argues strongly that “I am beginning to think that the vision of a network as value-free, autonomous etc. is nothing but a mirage.” Stephen posted this item on 4 November in The Daily. Ken and Stephen both demonstrate the possibilities of discourse in their posts but I take Stephen’s points to be axiomatic of engaged participation in web based discussion. I do have a utopian vision for connectivism. I feel that is is infinitely preferable to dystopia. By the time Lori posted about lurking, success and failure I was ready to comment. The same for Matthias‘s post too. Jason discussed failure issues in his post and offered a pragmatic way forward. He linked to Tom‘s post on wasted time. (This combination of Jason and Tom sent me off to look at John Perry’s Structured Procrastination website. And then Mike‘s post appeared… I have an enormous admiration for Mike’s knowledge and skill. I was amazed by his Dylan rendition in the video in the post. However I was relieved … for some reason I had already pictured Mike as the Arlo Guthrie of the ICT world. I thought the content of his post was a delightful addition to this week’s discussion (the post has drawn five responses to date). It encouraged me to think about the conversive trauma potential of education (as discussed by David Hargreaves compared to the aversive trauma of schooling. I got all my times wrong on Thursday and missed the Elluminate session. I thought it was with Nancy White but discovered that the first session was her time in the course. I like The Daily‘s follow up with notes shared by Christy, Diego‘s post and Bob‘s screen capture. (Jenny‘s post gave me more reason to rue my absence as did Michael.) Just when I was looking forward to listening to Nancy, The Daily posted this link (via Leigh Blackall) from Nancy. I thought I was managing my time reasonably well in CCK08 but I have eleven other tantalising options this week. My WordPress Tag Surfer has alerted me to Ken‘s second paper, a number of posts by John Mak, a paper on the Simnet blog, Bradleyshoebottom’s paper, Adrian‘s reflection paper and many others! I did read Lani‘s post and her post like many others reaffirmed my utopian vision of CCK08 this week. Some of the posts this week were visually stunning. Irmeli‘s post in particular was rich in images and discussion. 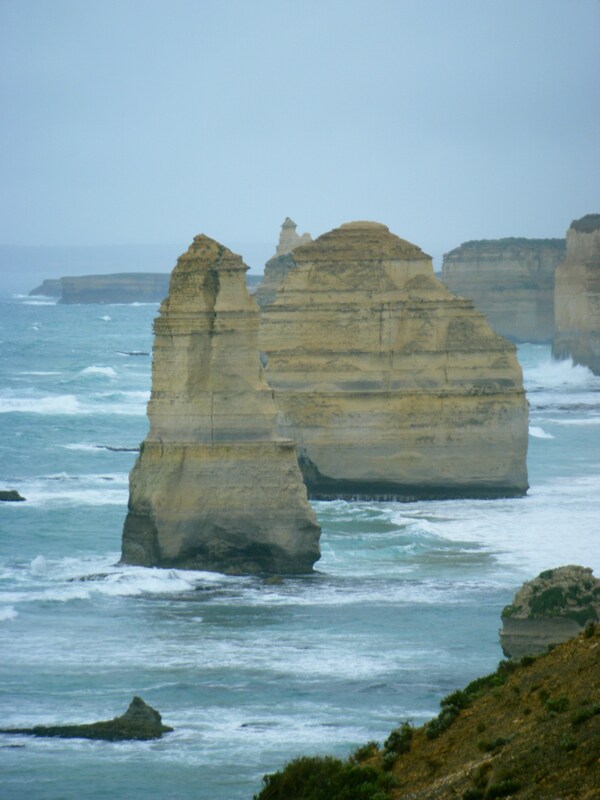 (I did try to visit every Google alert this week) … and this takes me back to the Twelve Apostles! The day we visited it was very, very windy. Despite the low temperature and the driving wind, hundreds of people were making the most of their time there. 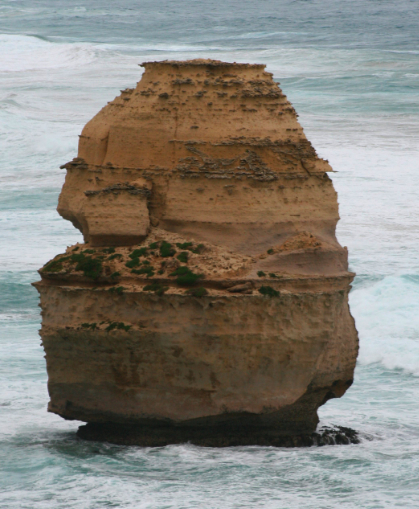 Some of them are people who will take Flickr over the 14,000+ count for the Twelve Apostles. The wonderful feeling of being there will mean that many of them will return there either physically or virtually. It is an intuitively right place to be. Sychophant or not I think that CCK08 is that kind of place and that we have been strengthened by the cumulative events of the course.